Provides protection and support. Aids in the prevention and rehabilitation of quadricep and hamstring muscle strain. Measure around middle of thigh muscle. The Vulkan Neoprene range features premium quality neoprene. This offers the best possible combination of support, compression, heat retention and comfort. Vulkan Neoprene has a unique spiral lining which is critical in removing excess sweat which avoids skin problems and is more comfortable to wear. By retaining heat there is an increase in the elasticity of the soft tissues. This is helpful for the treatment and prevention of a thigh muscle injury. By increasing local blood flow, healing and recovery times can be reduced following a thigh injury. 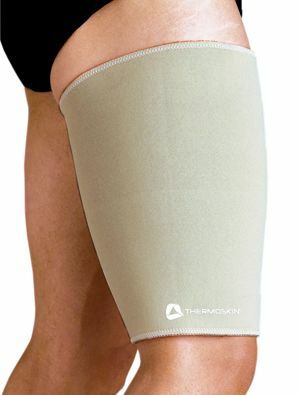 The Vulkan Thigh support can also be used as a preventive measure where there has been a history of thigh muscle injury. By warming the tissues and acting as a heat retainer it can reduce the risk of re-injury. The Vulkan Thigh Support can be useful during acute and chronic hamstring and thigh muscle strains. The warmth provided by the neoprene support can also be very useful for the prevention of hamstring and thigh muscle strains. It is easy to apply and doesn't restrict movement, making it ideal for use in all sports. The construction of the Vulkan Aerotherm Neoprene Support is unique. The closed cell retains body heat whilst the patented spiral lining stimulates micro-circulation and removes excess perspiration. This, together with the benefit of uniform compression, has been proved medically to accelerate healing, relieve pain and stiffness and control swelling. The Vulkan Neoprene Shorts offer compression and support for thigh groin and hamstring injuries. Lycra crutch allows complete freedom of movement.